Set in the bush fronting on to the beautiful Rangiputa Beach on the Karikari Peninsula, DreamCatchers boutique tents balance comfort and style with nature’s beauty and tranquillity to create a magical experience. Plus a 10% end of season discount!! With your yurt like tent, set in your own private clearing amongst native New Zealand bush you can stroll down the path to the beautiful white sands of Rangiputa beach. Soft beds, pure cotton sheets, wooden floors, your own covered kitchen and solar shower - it really is a touch of luxury close to nature - otherwise known as glamping! DreamCatchers tented accommodation is located on Rangiputa Beach, a true watersports paradise. You can kitesurf, paddleboard, wakeboard, waterski, kayak, snorkel, dive, sail, fish – whatever takes your fancy. We are totally off grid here, so lighting is by solar power, and cooking is by gas. We can charge phones, cameras and computers for you, though it's best to come with them fully charged, or even better to forget about your phone and computer for a while, and really escape! The Karikari peninsula is one of the best places in the world to kitesurf with beaches facing every direction. As Kari means wind, there is usually always somewhere to kitesurf and spots vary from flat water at Rangiputa, where you will have private access to the beach, to waves at Tokerau Beach. You can take lessons in our kitesurfing school or just get out there and enjoy. And if you don't want to kitesurf, the different beaches within a very small distance of each other mean there is always somewhere sheltered to sit and relax. Explore the beautiful harbour by paddleboard, or snorkel the reef to see the amazing sponge gardens. Catch snapper from the beach or charter a boat for the day and cook your catch on the barbeque. There is a beautiful winery within 10 minutes drive with a cafe offering coffee and lunch with stunning views, and lovely shops and restaurants at Mangonui half an hour away. We have a strict no fire or naked flame policy due to the high fire risk in summertime, and there is a total fire ban on the whole peninsula including the beaches. If you smoke we ask that you put any cigarettes out completely in a sand bucket or with water to avoid any potential risk, and please don't smoke inside the tent. Please don’t use lighted mosquito coils or candles, and instead use repellent and spray if needed . Your tent also has a mozzie net. Access to a range of watersports available on site including kitesurfing and paddleboarding. Our three glamping tents are set within clearings in the native bush of our 12 acre beachfront property. This is a really unique place. We loved how you felt like you were staying in your own private bush. We really enjoyed our stay here. The clearing where the hurt is was a beautiful setting. You are just a few minutes walk from a beautiful beach. Then just a short drive away there are more stunning white sand beaches. The area is just beautiful. We had everything we needed and it was all really clean. And we found the toilet completely fine. We would definitely come and stay again. Also Zoe was so so helpful and even got a portacot for our little one to sleep in. Gorgeous glamping in a beautiful forest, very close to a stunning beach. 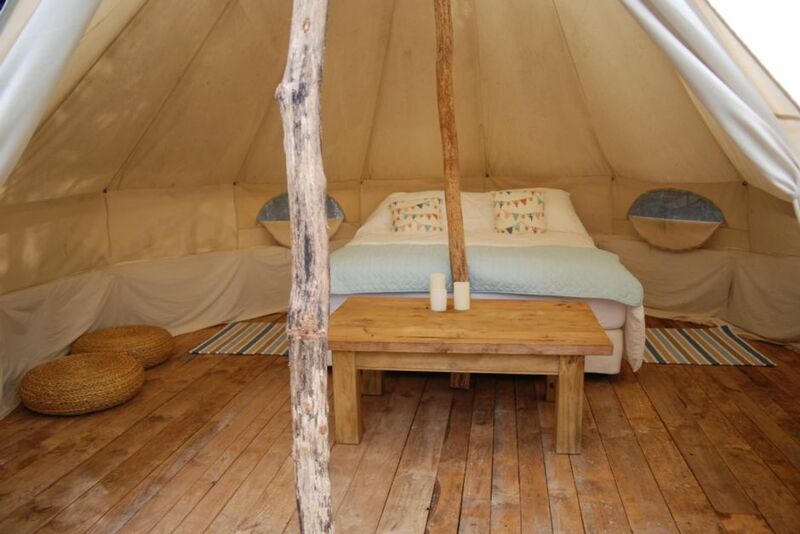 Gorgeous glamping in a beautiful forest, very close to a stunning beach. Perfect for kids, would love to come back. The bed was amazing ! Felt this was far too pricey for what you get - toilet was 'confronting' and over-full. Felt this was far too pricey for what you get - toilet was 'confronting' and over-full. The solar shower was hopeless, they could at least spring for a gas shower. We could have - but really didn't want to shower at their group campsite. We where hoping for a secluded weekend but were kept awake by the shout-singing of neighbouring all night party. The tent and set-up is sweet. Seemed to be a lot of flies at the beach - perhaps from a storm the week prior. Nearby beaches were absolutely lovely. This was an amazing place to stay and totally unwind.